In January 2018 I released my first book, SUN NIGHT: A Memoir, about my brother and I growing up in Panama. It was a project that took three years to complete, but about 40 years to be ready for. The last chapters were the ones that took the longest and were the most difficult to complete. I finished writing the book in May 2017, but that was just the beginning. Even though there were a lot of items to check off the list to get the book published, I felt organized internally in my mind. I think it helped to have that instilled in me since I work in the design industry where one has to show clear results within a deadline. One of those items in my list involved working with Sam Hubbard, my good friend and editor of the book. Having edited previous books in the past, I trusted her to give SUN NIGHT the appropriate love and attention required. Imagine being a first time author, and showing your work to someone that is an avid reader and editor. Sam took my book and gave it the care it needed. It wasn't something that could be rushed. Something I learned since early on. I was so excited to release the book, that I couldn't wait for all the round of edits. And there was so much more. I didn't only write the book, I also created the cover art and laid out the front and back cover, laid out the interior of the book for both the print and electronic version, in addition to the marketing and website design. I also learned how to sell the book on Amazon, Apple and other book stores, as well as taking credit card payments. It was all exciting, but at times mind-blowing. It was a lot of work, but I never questioned myself that I could do this. The cover art is a paper collage that represents the rays of the sun starting in the center in white to yellow, orange, and red toward the outer rim. The collage is actually an important element in the story and I felt it needed to be something I created. The work for the cover started a year earlier. I never created any concepts. I had concept the design in my mind for such a long time, that once the work was complete, it turned out exactly how I had expected or visualized. Once I finished writing the manuscript, I began to lay out what the cover would look like, creating a total of 10 versions. It was evident that it would be a formal design based on the composition of the collage. I tried so many different typefaces for the title, but only a few seemed well to represent the feeling of the story. They were Perla and a cursive script. While I loved the cursive, it felt too playful for the tone of the story. I went with the more formal Perla. The cover was not embellished in any way, however the letters were made to look as if the collage elements were glued on the board over part of the letters to make the title more inclusive of the overall design. As a first time author, I decided to create a simple back cover using a darker hue borrowed from the front. The short synopsis and author bio were laid out with corresponding photos. This was done intentionally to make it easy for anyone to get a clear feel for what the book was about in addition to learning a little about me without taking away from the story summary. The layout of the gut of the book was quite a challenge for me but I did a lot of research. I quickly learned that there wasn't a specific rule but most books were laid out in a simple manner. I took my time laying out each page of the book to ensure that everything not only looked visually pleasing, but also following appropriate writing styles. I took part of the collage cover and created a partial sun ray design in black and white that was used as an illustration at the beginning of each chapter. I researched several options to publish the book, and decided to self publish in order to save time. This meant that I would have to pay for the production and create all the marketing on my own. I worked with Blurb.com to get the book produced in two versions: a hard cover and a soft cover. Blurb's platform also allows authors to launch the book with the Ingram marketplace, a worldwide distribution system for books. This allowed for the book to appear on Amazon, and any online book store. A marketable way for me to reach to prospective interest for the book was to create a website. I produced the site using Squarespace.com because they offered the ability to charge credit cards and help me manage the book sales process. Their templates are also very easy to work with and easily viewed on different platforms. The day I released the book, January 31, 2018 to be exact, I had such a mix of emotions. I was scared, sad, tired, but also excited, anxious, and happy. I was worried that people would judge me because I wrote a bad book, after all I was a first time author and wrote a book in English, my second language. I was also incredibly worried about negative feedback on Amazon and other sites. But above all, it felt freeing to release the book to the world. It had been such a long process, it felt like a huge achievement. I released the book with a Facebook announcement, I was literally shaking. I didn't expect many people to actually take notice but interestingly, everyone supported my project. For many it was a total surprise, but for those expecting it, it was welcomed news. I was surprised as well by the amount of people that purchased the book at first. Thank you to all those who have supported my dream. Earlier this year, I had the opportunity to create a campaign that would help enhance our loan assets by encouraging customers to use their credit cards and be entered to win a trip to a resort in Hawaii. Of course, it had to be our very own Disney Aulani Resort and Spa. The campaign included a mailer, a pre-approval letter, an email to three different targeted groups, print ads, online and in-branch presence. While this project could have been the standard job where we use characteristic photography assets from the company, we wanted to take the project a step ahead by creating memorable deliverables. We worked closely with the resort brand style guide and went to work with some concepts. All the print materials were created using InDesign. THE MAILER – For the mailer, we wanted to do something larger and in unusual dimensions that would attract attention when received in mailboxes. For that reason we went with a square design. In order to add some weight to the piece, we went with a 120 lb weight cover. The element that makes it real special is the use of a dye cut in the shape of a flower, which is used as a framing device to expose some of the most beautiful and colorful photography of the resort. The panels were all built together on each of its sides. This means that a lot of measuring was involved to ensure that the images would fit seamlessly when the panels closed over each other. In looking at the front panels below, the front panel (image of dad and child) on the right, and the panel next to it in brown (the back panel), were the same size. The other two panels' width were smaller in order to fold internally. The dye cut panel was glued onto the panel next to it in order to create the framing effect. The whole mailer was also glued with glue dots on the top and bottom corners (inside the front panel), in order for the packet to stay together. UPDATE – On April 2017, the Credit Union National Association awarded a Diamond Award for excellence in direct mailer marketing. The mailer with four distinct panels that when closed, connects the images together. The magenta area shows the dye cut. Detailed sample of the mailer interior with the first panel opened; Detail of dye cut showing lifestyle photography. THE PRE-APPROVAL OFFER LETTER – The letter came in a customized envelope that carried more of the colorful photography of the resort. The offer letter inside is legal size needed to fit all the required disclosure for the offer. The letter was designed following the brand style guide where photography assets are organized with white stroking without overlaps. PRINT AD – The only other print item designed for this effort was a full page print ad that appeared for several print runs of various local magazines. The print ad followed the same overarching photography and layout style. DIGITAL – The rest of the materials produced for this project were digital graphics for the consumer website and email deployment. These were created using Photoshop. The email included animated gifs of changing photos. The same images were used on the digital channels to connect with the print collateral. Consumer web site hero image. Banner ad for pre-approved customers. Pasión is passion in Spanish, and it is where the best of us comes from. When I am asked, what is my passion, my response is always Art. It has been since I first can remember and it will always be. From my early childhood watching my parents draw for fun and learning from them, through my discovery years when traveling abroad in Europe and finding out that this world is much bigger than the visual space around me. The paintings of the renaissance called most of my attention for their beautiful composition and symbolism, but I never thought that I had talent enough to be able to do it myself. I discovered oil painting during a difficult episode in my life and I instantly fell in love with it. 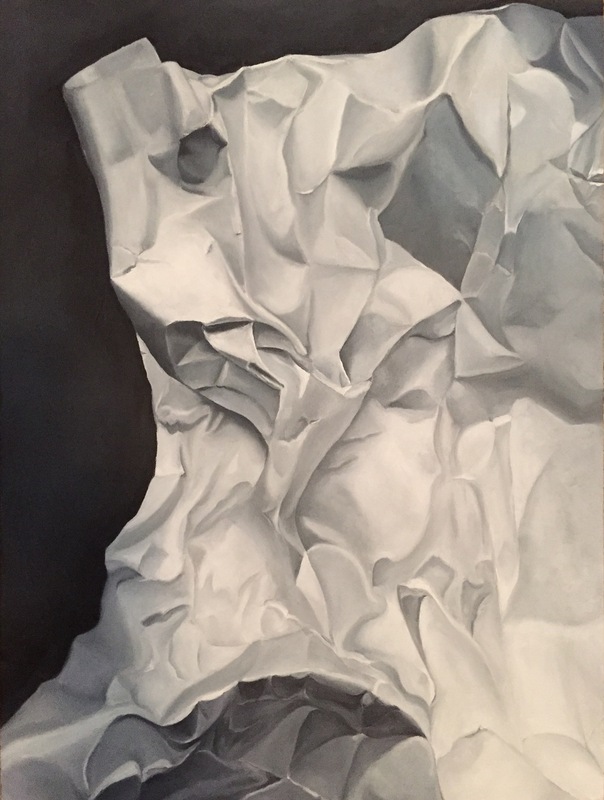 It was an intimidating medium for me, as it usually is on anything you don't know anything about at the beginning, but I found the courage and was determined to learn and try it out. While some people are fans of music pop artists, I am a fan of the old renaissance artists Michelangelo, Caravaggio, and Botticelli. Maybe I am just an old soul. As I grew older and my taste and aesthetics evolved, I discovered new artists and mediums but my passion to oil continued to grow. In the last ten years or so, I have discovered new artists that continue to surprise and inspire me, to name a few Odd Nerdrum and Kehinde Wiley. Let's say I learned to paint in oils on the job, while doing studies of paintings I admired. One in particular that is near and dear to my heart was the study of a Caravaggio painting "Betrayal of Christ". It actually took me a couple of years to complete because it was incredibly intimidating. I remember going to sleep thinking of the section I was to paint next and looking at the original for clues on how to make it happen. The amount of visual effects Caravaggio used in the painting were incredible and in the original, just plain successful. To make the painting my own, with all due respect to Caravaggio, I changed the face of Jesus to the face of a colleague artist of mine, in addition to his own hands. This is a huge painting, 60" wide x 48" tall. I was able to sell the painting to a hospital in Chicago. I often think of this painting as proof that I can paint. But it also taught me an incredible amount of patience and higher understanding of color and how it reacts to light and dark. I continued to paint for some time trying portraits and original work that included crumbled paper as in the samples below. I stopped painting for many years after my career change to graphic design. It was just energy consuming to design all day and then get home and paint. But through the years, I have felt as if something has been missing out of my life. Just this past May I decided to get back into painting. It was like riding a bike. I started with a paper study to get me back into the habit of painting. Here are some progress photos as I produced this study. I have a variety of ideas of paintings I would like to produce in the next few months. One of them is a new canvas I have started called Two Cranes. The painting has personal symbolism. It is about two origami cranes that I folded, then unfolded to unveil the lines that have been left from the folding unto the paper. The painting will be finished with a sky background. This is a painting in progress. If you work for a bank or credit union creative team, you know exactly how I have feel when the word "Deposits" comes up. It's like getting an automatic writer's block, in this case a designer's block. Creating marketing for a product as bland and boring as a "Deposit" is perhaps the biggest challenge for visual designers because of the lack of visual queues we can connect to the word "Deposit", especially if we are trying to go for the unconventional. Producing a unique design and successful creative while communicating the strategic needs of our brand is even more difficult. Most banks usually highlight the rates in big numbers. I am sure you have seen those everywhere. We've also done that, to be exact it was last year, but we went a little more unique by creating the numbers out of US coins. It took quite a while to create the graphics but the result was very successful. For this year's campaign we wanted to do something different and more unconventional. We did a brainstorm session where our fantastic writer and I started to play with words that we could connect to the effort, such as "Power Up", "Charge Up", "Electrified" came up. From those words I quickly came up with two ideas to pitch. For the first idea, I wanted to utilize the wealth of creativity that our company has to offer, and in particular the film Monsters, Inc. came to mind. My idea was to show the scream canisters but here used as canisters where people keep their money. For the second idea, I pitched the visual of a battery charger (such as a jumper cable) where the money is getting charged. After the meeting, I began creating concepts for both pitches since I had a little time to work on this project. The canister idea was interesting but when I went to design concepts for it, I quickly realized that it was going to be difficult to explain what the canister had to do with the idea of charging the money. For the second idea, I was able to find a perfect image on iStockphoto of jumper cables charging dollar bills. The image is exactly what I was looking for but it was not going to be enough to be convincing and engaging. I quickly looked for other images or sparks and electrical charges and was able to find some good choices that would work well for the project. Finally, I decided to use an image of metal texture for the background that closely matched our brand style. For typefaces, I decided to use a newly released modern clean font, something that no one has seen before in order to focus on a more fresh and new experience. I found a good font called Sullivan that came in three different versions: Regular, fill and bevel. I went to work once I had all my assets. My design process is very internal. I am able to get ideas in the brainstorming process and layout the elements in my head. I remember when I started to work as a designer, I sketched everything. Mostly they were blocks in a page to help me place the main elements of the composition. This helped me better visualize to the point that today it is a completely mental process. I can see visuals in my mind, and slowly create a full picture of what the design will look like before it is fully completed, often before the end of the creative session. I know when I do not fully understand a project because I usually have a hard time visualizing it in my head, and that is when I ask a lot of questions. Once I had all my graphic elements for this project, I started in Photoshop to color manage the image of the money with the jumper cables because the money didn't appear as colorful or as lively as I originally wanted. I proceeded to mask the image from the white space. Next, I pulled elements from the vector image that would work well in the space. For visual clarity, I was conscious to keep the money clear from the sparks and electrical charge effects while still showing the effect across both positive and negative sides. I actually ended up rounding some of the effects in order to better frame the electrical charges around the money. Finally, I added the sparks right where the metal connected to the money. Since the raster image of the spark was dark enough, I was able to apply a screen effect to the layer to remove the black space from the photo. I added the spark on each connector. Completed Print Full Page Ad. After the effects, I added the background and played around with drop shadows to give the design more depth. Once the design was completed in Photoshop, I moved on to InDesign to lay out the copy. Normally, I will do a preliminary headline in the same Photoshop art file for several reasons. First, I can align where the headline will go in the InDesign workspace, and secondly, it may give me more opportunities to be creative by adding effects to the headlines, something that is not possible in InDesign. For this particular project, I ended up including the headline in the Photoshop file in order to give the design even more depth. The body copy, call to action, logo, tag line and disclosures were placed in InDesign and the composition was complete. For this project, We created elements for the web and for our in-branch digital posters. We had motion graphics created that took full advantage of the sparks and electrical charge effects on the money. In 2009, while working at ESPN Outdoors/B.A.S.S. I had an awesome opportunity of being part of a brand refresh. B.A.S.S. created various tournaments including a grassroots program called the Federation Nation Championships, Bassmaster Elite Series, Bassmaster Opens, Bassmaster Women's Tour, and the highest professional tour, the Bassmaster Classic. All these tournament brands were designed by different people at different times using different styles. In 2009, we reached a point where we needed to consolidate the brands into one cohesive look to support that these came from the same house. Not only were the logos different from one another, but they all utilized different nomenclature, and they all felt individual instead of part of a whole. When the company decided to look at options for a new portfolio of tournament brands, it hired an external design firm to mock up with some options for us. One day my supervisor stopped by my desk and showed me the designs that the firm had been working on. My face said it all, I was in shock. Not because I liked what I saw, but the complete opposite. The comps we received did not show any creativity, depth of design, or understanding of the history of the brand. They did not express what the brand was about and more importantly, the marks didn't push the brand forward into the future, while respecting it's formidable past. The brand needed to be pushed forward to a contemporary audience exposed to digital media and social networks. The marks actually looked like someone had taken the simplest version in the old portfolio and only updated the color and fonts. I asked my supervisor if our leaders would let me come up with a couple of options and after confirming it with the VP of Marketing, I got the go ahead to work on the project independently from the external design firm. The samples below show you the variety of design aesthetics used on all the individual tournaments. They all said something different. Bassmaster Tournament marks prior to brand refresh. From looking at the brand marks we owned at the time, it was clear the logos needed to look more connected. I also considered where the logos would be used (in uniforms, print ads, billboards, television brand ID, promotional products, brochures, way-finding signs, etc). I looked back at what we had and started to draw some concepts based on the more favorable designs. The Elite Series logo was perhaps the most contemporary and engaging of all the marks in the old portfolio. It was the most different and it aided as the starting point to step from. After analyzing what I had to work with, I quickly realized that there needed to be a specific hierarchy to settle before finalizing the overall design. The Bassmaster brand was utilized across all tournaments, therefore it needed to be an important element of the design. We also needed to showcase the primary brand that started it all, the B.A.S.S. brand, but this presented some challenges. For the main brand, Bassmaster was the repeated factor on each of the old tour names. But they all called the Bassmaster brand in different ways. I took the brand Bassmaster as the primary brand, but connected it to the B.A.S.S. shield through the overall design. The order became clear and worked well across all tours: 1. Bassmaster; 2. Name of Tour; 3. B.A.S.S. shield. All marks would carry the B.A.S.S. shield as the umbrella brand that held all these tournaments together. Bassmaster Tournament marks after brand refresh. At first, I started by creating a couple of shape versions for the overall design of the mark. The first shape was very similar to the old Elite Series logo, oval in shape without the olive branches. The second was the shape of a bass fishing boat viewed from the front, with some overlapping graphic elements. I then proceeded to create shape concepts in Illustrator in order to call out the main shapes that would hold the letter forms of the brand names. Once the main shapes were identified, I worked in Photoshop to add visual effects and prepared them for presentation. The second shape ended up winning when I presented the designs to the senior leadership team. This was the most dynamic and fresh of designs from the two options. The next step was how to separate these tournaments, beside their naming convention. We could have simply created one version in one color with the different naming conventions. There is actually a step process similar to the medal options in an Olympic competition. In order to qualify to compete in the super bowl of bass fishing competitions, the Bassmaster Classic, an angler has to make it through the Bassmaster Opens and the Bassmaster Elite Series. Following the metal comparison used for Olympic medals (gold, silver, bronze), I used a bronze color/metal effects to denominate the Bassmaster Opens Tournaments, a silver color/metal effects to denominate the Bassmaster Elite Series Tournament, and a gold color/metal effects to denominate the Bassmaster Classic. At the time, there was an active Women's Tour, and for this mark, we used a red color/metal effect. Finally, I utilized a blue color scheme representing water to denominate the Federation Nation, which is the originating club where most professional anglers come from eventually. The design concept was complete. The creation of the logos was not as easy as it sounds. This took hours of work in Illustrator to get the exact shapes needed, then work in Photoshop testing different type of metal effects, colors, special effects, lighting effects, etc. I especially took care in building lighting effects from different directions so that the marks would look more lively and engaging. These logos needed to be large enough to be used in billboards or small enough to fit in newspaper or magazine print ad. Finally, all the logos needed to have excellent visual clarity for use in television broadcasts and digital channels. In the tournament library, only the professional tournaments carried the full color three-dimensional design, helping to separate them from the rest. For each individual logo, I created a vector option of the raster logo design in order to guarantee the quality of the logo if it was blown up for large scale banners or other large output. Once the brand marks were approved, the brand style guide was created to incorporate every version needed, such as black and white versions, reversed, and flat versions of each tournament brand. The style guide included the usual: color styles, do's and don'ts, and specs. The response from these logos have been very positive. I will never forget the day when our tournament event director viewed the logos for the first time and said that he would be proud to wear his baseball cap with the new tournament logos on it. From top to bottom: 2016 Bassmaster Classic large scale digital signage, Bassmaster Opens signage and trophy, Bassmaster Elite Series angler collectible cards, The Bassmasters Television Programming. The summer of 2015 was hot, really hot, and the same were the expectations to attract new customers to act on our auto loans by the end of summer. We had done all types of marketing in the past focusing around interest rates, terms and other features, but this time we started from scratch by splitting our audience into two and designed communications specifically for them based on the features that usually appealed to them as found in research data. The creative brief was ambitious: attack the two different audience groups three times in a three-month period by mail using different types of mailers, coupled with three emails that followed up each mailer. In total the deliverables were 6 different mailers, and 6 different emails. For the first piece, we created a self-mailer with 6 panels (three on each side). This piece reinforced facts about the offer. The second piece was a letter with a well designed outer envelope that highlighted how the audience could save more with our offer. The third piece was a post card that reinforced a specific benefit of the offer. For the audience targeted with the new vehicle offer, the look portrayed a close up of a bright red car, close enough to see the specs of paint. The headlines were designed to look like chrome logos. The design was to be simple, to help focus on the message. The emails also followed the same look but were designed to fit the digital space with strong headers. For the audience targeted with pre-owned vehicle offers, we designed the same three mailers and emails but with a different look than the new vehicle offer. The style utilized pattern in the design which was made profound by the integration of real customer testimonial photography. There were constants on both audience creative looks, such as the the integration of real customer testimonial photography, the use of our brand colors, and clean design and simple messages that are easy to digest. Within each campaign, we kept the same fonts and effects to enhance the story from one piece to another. The project was so well received, it exceeded our loan goals. The month of September is considered Life Insurance Awareness month across the country and you may see increased marketing around the subject matter. In an effort to highlight life insurance at Partners FCU, with the help of our insurance partners, we put together a campaign tactic focusing on the real cost of insurance which continues to be very low. The concept I created was simple, and it needed to be in order to allow our audience to welcome the communications in a special way. The visuals of coins adding up a dollar is all it takes to invest in life insurance for your family. The simple line that reads WHAT YOU GET FOR A DOLLAR A DAY became the most important message, followed by "A dollar doesn't go very far these days but it can still buy you and your family affordable life insurance." To highlight the coins even further, motion graphics were used to create waves around the coins. Since we had an already established relationship with a 3rd party insurance company, we were able to collaborate with copy-writing that supported the messaging. The main communication piece for this campaign was to be a mailer with a coupon and a business reply envelope. The letter included a handy work sheet form that customers could fill out to analyze how much life insurance they need. After the letter was mailed, we followed up to those same customers via an email that included similar creative and messaging. We also supported the campaign at our branch locations with digital posters and buck slips, while on our consumer website, we promoted as an ongoing promotion mention (via a hero image that customers were able to click through to a detail page that linked to the insurance company site). In the summer of 1983 I accompanied a friend who wanted to audition for a musical at Teatro En Circulo, in Panama City. The show was Hello Dolly, and it was being directed by one the most important directors in Panama, Bruce Quinn. I didn't know much about the show other than some memory of Barbra Streisand in the film version. We arrived at the theater where my friend signed up and waited for her turn to audition. This was all new to me, not knowing much about the theater other than seeing the Spanish tour of Jesus Christ Superstar earlier that year. The idea of being part of a show was appealing to me more and more as I sat in the audience watching the audition unfold. My friend passed the first audition with an assistant to the director and while we waited for her next round, she kept pushing me to audition as well. I was nervous, and as an introvert, it was very difficult for me to see myself auditioning for a show of this type. After a moment, and perhaps because of pressure from my friend, I signed up to audition. I stood up on stage and sang a song with others, and right then and there I was selected. Unfortunately, my friend wasn't and she didn't talk to me after that. Never for a moment did I think that I could get a part in a musical, less work for renowned director Bruce Quinn. Hello Dolly program and cast photo. Hello Dolly was not only the first show I ever worked on, but it was the starting point for something that I truly enjoyed doing. The theater experience filled my heart when I felt lonely, it filled my mind to learn about the discipline required to be successful, and it allowed me the opportunity to make some really good friends. Two years later, Bruce Quinn got ready to direct West Side Story at the Panama Canal College Auditorium. Bruce had actually directed this musical back in 1968 with an unknown Ruben Blades. I did everything possible to get a part in the show and after an easy audition, I got the part of Luis, a minor role in the Sharks gang. I was going to be part of this historical moment. The show was staged in a combination theater in the round connected to a standard stage auditorium. Bruce updated the look of the show to the 1980's with Punk fashions that included Michael Jackson-type leather jackets to showcase the New York gangs depicted in the story. For me, it was also interesting how he mixed the Latino and Anglo talent within the show but unlike the story in the musical, the diverse cast got along really well. I made some really good friends from this experience and learned a lot about staging this difficult play. The show won best musical in Panama that year. West Side Story program and cast photo of the Sharks Gang, with two of my best friends David Silva (standing behind me) and Javier Barahona (sitting next to me). In the summer of 1985, I had the great opportunity to live in New York for a month between June and July. Shortly after I arrived there, it was impossible to miss any of the Broadway theater advertising on the streets, television, radio and newspapers. Cats at the Winter Garden Theater was the first show I ever saw on Broadway. The whole theater was decorated to make you feel like you were part of the show. I was hooked. Then followed The Phantom of the Opera. I remember not being able to afford a seat to see that show, so I saw it in a standing section behind the orchestra seats. It was magical and upscale, what a musical! Once back in Panama, that same year, I decided to return to the University to continue my studies in Computer Science and immediately signed up for the Teatro El Desvan Drama Club. I participated in two shows with the University drama club: Las Fisgonas de Paso Ancho by Samuel Rovinski on September 1985 and then Prohibido Suicidarse en Primavera by Alejandro Casona, on December of that same year. Between 1986 and 1988 I was fully immersed in full time work with the Panama Canal Commission and then the U.S. Army South, while also attending the University at nights. In the summer of 1988, I couldn't resist it and returned to the theater to work for the Theatre Guild of Ancon's production of Biloxi Blues by Neil Simon. I was cast in the role of Carney, which was perhaps one of the most difficult roles I played because of the unique accent and extensive lines, including a cappella musical numbers alone on stage. Biloxi Blues program and cast photo. From left to right: Richard McQuown, me, and Christopher Etter. My interest in the theater kept growing beyond acting and once Biloxi Blues was over, I signed up to be a Stage Assistant for the next production at the Theatre Guild of Ancon, the show was The Nerd. For this show I did a lot of different things that included set construction, painting, setting up lighting, and organizing all the props and set elements. This show was not only entertaining and fun to work on, but it also taught me a lot about stage management and how important it was to the success of any theater production. The last show I was lucky to be part of at the Theatre Guild of Ancon was called Nunsense, by Dan Goggin. I happened to travel to New York while the show was on rehearsals and was able to speak with Dan Goggin directly on the phone. Bruce Quinn, who was directing the show had a question about a scene and who better to know than the creator of the show. Dan was very kind and helpful, as well as excited to know that his play was being produced in Panama. In Nunsense, I played the part of Stage Manager, which is an actual part on the play but realistically is a real Stage Manager. The difference here is that the Stage Manager opens the show in full priest attire. I still remember this show fondly, perhaps because it was the last show I ever worked on before moving to the United States. Nunsense program and cast/production photo. Fast forward to 1996 in Orlando, Florida, I was working as an Animation Artist for the Magic of Disney Animation Tour when a great opportunity came about to work on the Disney's Hunchback of Notre Dame Animation Celebration Show. The production had toured the country in a popular mall tour earlier that year, and now the show was being cast for a special event that took place at the Disney-MGM Studios (known now as Disney's Hollywood Studios). The show involved explaining the process of animation and how the film was created to park guests that attended the event. It was heavily scripted with intricate staging that included playing an automated piano, drawing in front of a camera at an animation desk and a large monitor wall that showed sequences under the control of the artist. The three-level set was framed by a oversize open book and was decorated with the look and feel of the Disney's Hunchback of Notre Dame film. After the Animation Celebration was over, we were told about an upcoming event called the Disney's Hercules Mega Mall Tour which would take place in early 1997. I was able to get an audition and was hired as a tour back up animator. In January of that year, a team of 4 artists were sent to California to train to draw the characters from the film. We underwent a rigid training program with Feature Animation in Burbank. We toured the studio and met with animators Nik Ranieri (Hades Animator) and Eric Goldberg (Philoctetes Animator) in order to understand the character personalities. Half the time was also spent learning the script, staging the show with the director and cast as well as rehearsals. After the 30-day training, the tour debuted in Atlanta, Georgia. I was able to tour 13 of the 26 city stops which was a fantastic way of seeing the country. This has to be one of the biggest highlights of my career at Disney thus far. My love for the theater has grown through the years and even though my career has taken me in the direction of the graphic arts and marketing, I continue to participate in the theater experience. in 2012, I had the opportunity to work with a local community theater, Mad Cow Theater, to create poster art for three of their shows: Dancing At Lughnasa, Hedda Gabler and Private Lives. The fact is that the theater saved me. The whole experience helped keep my mind busy and focused on something more joyful in the moments when my life wasn't. It helped me mature into a more responsible individual as well helped me build genuine relationships with people. The thrill of being exposed on stage also helped me combat my insecurities and introversion. It all helped me be who I am today and no one can take that away from me. I have always believed in living my life to the fullest and if it meant doing something scary, which for me it was totally, then be it. I did it and it made me a better person for it. After my temporary assignment as an Animation Artist ended in the fall of 1996, I had the incredible opportunity to transition to a small but unique team within feature animation called Ink and Paint. For those who may not know what a cel is, cel is short for celluloid. A transparent sheet of plastic made out of celluloid that was used to transfer the drawings that made an animation frame. The lines were inked by hand usually on the front of the cel (before the invention of the xerox machine), while the back of the cell was filled with cel vinyl paints of different colors that made up the character movement of the scene. I quickly realized that building positive relationships was a winning quality to help achieve my dreams. Coincidentally enough, a prior supervisor was married to the manager in charge of the ink and paint team at that time and was able to connect me with her in order to test for the position. I had never painted an animation cel other than the paint by numbers cels that Disney sold at their stores, but what truly helped in landing the job was the drive and personality that I brought to the summer assignment as an Animation Artist, a job that took me out of my comfort zone every day. Imagine an introverted and private person, describing animation technique to a group of strangers. That was my first artistic job, and what I did on a daily basis as group after group walked through the Magic of Disney Animation tour, at the Disney MGM Studios (presently called the Disney Hollywood Studios). Amazingly, a surprising extrovert side of me came out in my presentations. This job in particular offered me an animation internship with the studio that prepared me to answer any question that our visitors would have about the process of animation. The internship also exposed me to many artists and animation professionals that shared their talents and experiences with me. I passed the ink and paint test and quickly initiated my permanent position with Ink and Paint. This was especially exciting at that time because this meant that I would be part of the "Show" in the Animation Tour. At that time, the ink and paint area along with other departments sat in an area coined "the fish tank" where visitors to the Animation Tour could see the artists at work behind large glass windows. The Ink and Paint section included a backdrop of paint glass containers of all the paint colors we'd ever used. There were 4 rows of 2 animation desks per row that filled the space. The team consisted of about 5 to 6 artists, not all at one time. A view of the Ink and Paint studio desks from the audience side of the animation tour back in early 1997. Getting used to wearing gloves to paint cels was quite necessary to keep the cels from fingerprints, scratches and dings. I remember being aware of how distracting and often entertaining the view of the audience was behind the glass. Waving at the tour visitors behind the glass was a daily event, in addition to the constant glare of the flashes that seemed to bounce from one glass surface to the other around the studio from guests taking photos with flash. Of course, the job was not all fun, it was actually quite extensive. There is a specific process in which animation cels are painted. Light cotton gloves are required to paint cels in order to keep the cels clean from hand dirt and oils. Darkest colors are applied first, lightest colors last. So if I was painting a cel with Mickey Mouse on it, the first color to be applied is black on 8 to 10 cels laid out on various drying racks positioned in front of the desk. Then one returns to the first cel painted and the next color is applied, let's say red. The red would be applied to all the cels, and so on until all the areas of the character art are filled. While our cels had pre-printed lines on the front; for limited edition cels, lines often were applied by hand, an extremely difficult task that only a few artists were able to accomplish. Daily cel quotas needed to be fulfilled, which depended on the cel type that was being painted. I was lucky to come into the team when the first cel available to the consumer was still being painted. It was called Animator Mickey, a beautiful animation cel of Mickey sitting at an animation desk. Because the cel was so popular, we had to paint this cel at least one day a week in a round of 8 to 10 cels at a time in order to keep inventory. While it was not the hardest cel to paint, it was still challenging because the areas of paint needed were rather large and knowledge of the consistency of paint was necessary to understand how much time one truly had to paint the surfaces before creating dry lines within the spaces that were visible on the front of the artwork. We also painted two compositions that had very small Mickey Mouse poses that had an important connection to the studio, they were the Traveling Mickey (as pictured on the photo above behind my head) and the Climbing Mickey (a re-creation of the statue that welcomes guests into the the Animation Courtyard area outside of the Animation Gallery. The Traveling Mickey was inspired by the animation tour itself. Throughout the original animation tour, guests were able to see a Mickey in different positions and level of execution that would explain the animation process in the simplest way. Therefore, the animation cel was composed of three Mickey's that were printed on an animation background, while the last two Mickey's would be printed on a cel and painted by the artists. This cel was quite difficult to paint because of the small character size. 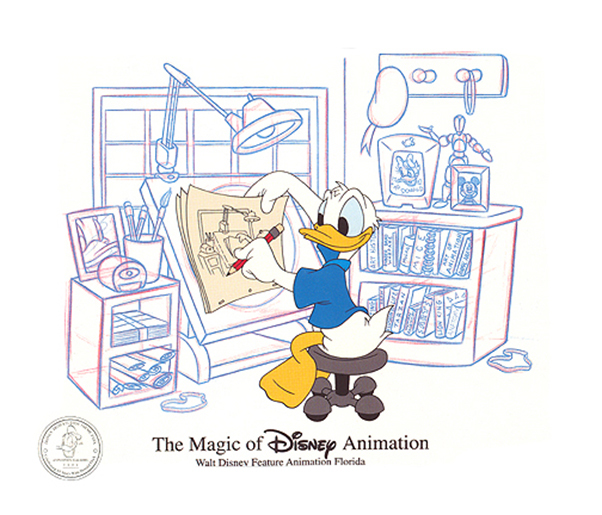 As the studio saw opportunities in celebrations and character popularity, a Donald at the Animator desk was launched, later followed by a Millennium Mickey cel that was only available in the year 2000. Besides painting in the studio to keep healthy inventory, we also painted "on stage." This meant that on one or two days a week, we would work at the animation gallery painting cels in front of our park guests. It was fulfilling to speak with people from all over the world that were just in awe of the work I was doing at the studio. It was truly an honor for me to represent the studio while on stage and its an experience I will never forget. People would just stand in front of me sometimes for hours just looking at how I painted cel after cel, and explained the process. I also had the amazing opportunity to create a watercolor background for a very special cel in my heart called Friendship in Bloom. The cel was created exclusively by the animation ink and paint team to celebrate the release of Disney's Mulan, which was made entirely at the Florida studio. I was also able to create the limited edition stamp that was heat-transferred onto the cel to commemorate the film and cel release in 1998. This was actually the first piece of graphic design I ever created for Disney and an important step toward the future of my career in design. The last cel I painted before leaving the Ink and Paint department was the Tarzan cel back in 2001. It was incredibly dynamic cel that was very popular among collectors and animation art enthusiasts. By the time I left the studio, I had already been exploring a new path in my career in graphic design but I think that I became a better designer thanks to all that I learned while working at the studio that included attention to detail and thinking outside of the box. In looking back at some of the big projects I have worked on in the last year, one comes to mind, the Visa Signature card deployment. The work involved creating a design for the plastics and then cohesively create the brand identity to support it. We developed the design to continue the color scheme of the cards. The style for the Visa Signature launch includes the use of red and black, two of our main brand colors. Black was used as the ground where to lay the text for the luxury feeling it evokes when placed next to aspirational lifestyle photography. A light version of Helvetica was used for the copy to make the content easy and inviting to read, while a bold option was chosen for headlines. We used metal inks for all copy on the brochures and envelopes to give the presentation a higher quality finish. Our style guide uses a red bar on the top of our brochure line and to continue the layout style and keep it consistent with other collateral, I created a more upscale bar with a field of doinks and a metal surface effect behind them which plays well with the photo assets below the bar.